When the elected official with more power than any other to deliver your campaign goal comes to speak at your local university, you kind of have to show up. Accordingly, when Blue Skies Campaign learned Montana Governor Steve Bullock was scheduled to speak at the UM campus in Missoula Tuesday, a group of us got ready to go talk to him about coal. Our mission was to let Governor Bullock know UM students don’t like the idea of mining state lands so Arch Coal can profit off selling coal to China, polluting rail line communities and destabilizing the climate along the way. 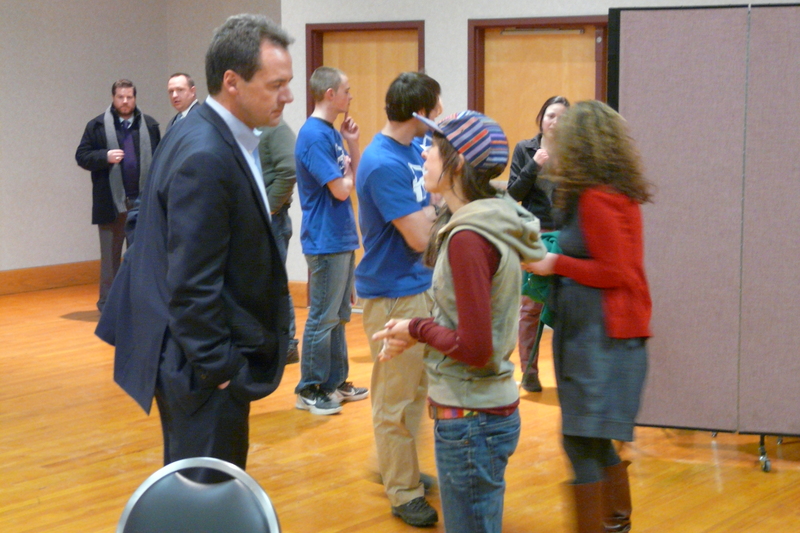 The gathering where Bullock was speaking would have been a great place to commit to protecting Montana from coal pollution; he was at UM to address students involved in MontPIRG (the Montana Public Interest Research Group) at their semester kickoff meeting. I have no doubt most students in the room would have been glad to hear their Governor take a stance against selling their future to Arch Coal. But Governor Bullock wasn’t there to talk about coal, and might have avoided saying anything about the issue at all if we hadn’t raised it. 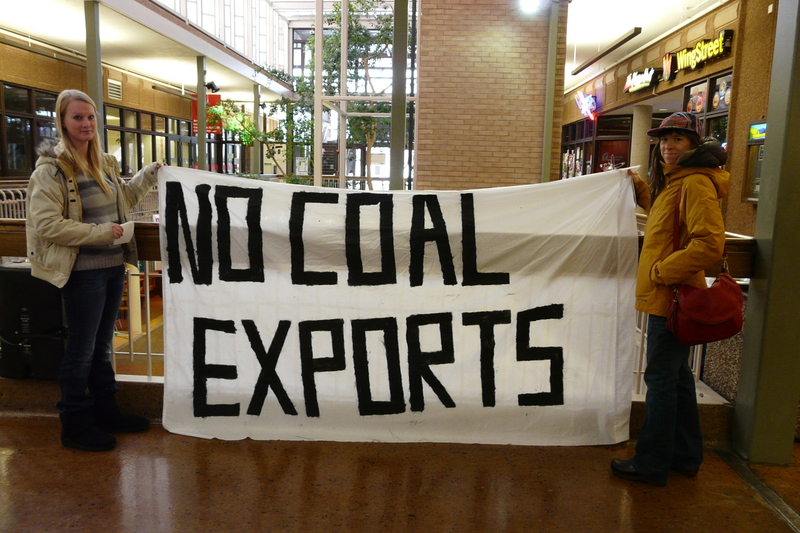 As he and his envoy of staffers came up the stairs of the University Center, en route to the ballroom where he’d give his speech, Blue Skies volunteers greeted him on the landing with our “No Coal Exports” banner. The Governor smiled and continued quickly on his way – though I managed to slip him a sheet about Stop the Coal Train Strain on Feb 22nd. Our group followed him up the the Third Floor ballroom, where people were milling around. One of our members went up to talk to the Governor about coal exports, conveying that this is an issue of enormous concern to Missoulians. The Governor’s response was uninspiring: he told us he’s committed to “letting the review process” for Montana coal mines run its course, but that he supports the idea of coal mining. He told us coal will be an important “part of our energy mix” for a long time, apparently implying Arch Coal’s mining plans will somehow help meet US energy needs. This despite the fact that Arch wants to ship its coal overseas, mostly because US coal demand is declining. Soon the MontPIRG meeting kicked off, with Bullock’s speech as centerpiece. It was a good speech in many ways: the Governor stated his commitment to making voting accessible, encouraged students to get involved in politics, and even threw in a line about Montanans’ State Constitution-mandated right to a “clean and healthful environment.” But here’s the thing: open pit coal mining, diesel fumes from coal trains in residential areas, and climate change caused by the overseas coal combustion aren’t very conducive to environmental health. The Governor didn’t have much to say that. He thanked me (politely) for expressing my views, then hurried out of the room. At no point did he indicate he intends to lift a finger to protect rail line communities from coal pollution. Indeed, Governor Steve Bullock doesn’t seem to feel that protecting Montanans from toxic coal pollution is his responsibility. This despite the fact that he presides over the Department of Environmental Quality, which can determine whether Arch Coal’s Otter Creek coal export mine breaks ground. While he claims to care about a clean and healthful environment, the Governor seems prepared to deny this right to hundreds of Montanans. When that’s the attitude of the top elected official in your state, you kind of have to do something. Fortunately, I think we’re up to that challenge. Join us this month to help stop the coal train strain.